Depression in the elderly is a rising problem worldwide. The prevalence rate of depression in the elderly participants across the Indian studies is in the range of 8.9-62 per 1,000 in the community surveys and 42%–72% in the clinic-based studies. The presence of a physical illness in an elderly individual is almost a universal phenomena and the majority of the elderly participants have at least one physical comorbidity such as Parkinson's disease, hypertension, coronary heart disease, diabetes mellitus, chronic kidney disease, benign hypertrophy of prostate, and malignancies.,,, It is also now a well-known fact that there is a bidirectional relationship between physical/medical comorbidities and depression, and more particularly in the elderly, presence of a medical comorbidity can affect the symptom profile, course, and outcome of depression., The presence of multiple physical comorbidities in late-life depression can further complicate the selection of medications due to the risks of drug interactions and decreased physiological and cognitive reserve in the elderly.,, Undiagnosed physical illness in elderly with depression is also not uncommon which further add on the morbidity.,, Thereby, it becomes highly essential and complex to manage both depression and medical comorbidities in the elderly together, and many a times, it becomes a clinical challenge to the practitioners. Although there are many studies from India- and other parts of the world, which have estimated the prevalence of depression across different physical illnesses,,,,,,, there is limited data on the prevalence of physical illnesses in elderly with depression. Data from the developed countries are also limited in this area.,, Few previous studies from India have evaluated prevalence of physical comorbidities in elderly with depression,,, and these suggest that hypertension, diabetes mellitus, osteoarthritis, cataract, cardiovascular illness, and cerebrovascular disorders are among the most commonly encountered diseases. However, these studies have varied regarding the prevalence of most common diseases in elderly with depression. In addition, it has been seen that a large number of elderly with depression have undiagnosed physical illnesses.,, A recent study focusing on the symptom profile of elderly with depression with medical comorbidities revealed that presence of any physical comorbidity did not influence the manifestations of depression. Prescription pattern studies from the West among elderly with depression suggest that over the years there is increase in the use of selective serotonin reuptake inhibitors (SSRIs) and decrease in the use of tricyclic antidepressants (TCAs).,, Although reasonable data is available on the prescription patterns of antidepressants and psychotropics from India for adult population,,,,,, but data with respect to prescription patterns of psychotropics in the elderly participants is limited to a handful of studies., Although there is some data on the antidepressant prescription pattern in the presence of medical comorbidity among adults, there is lack of data on the prescription pattern among elderly with depression with physical comorbidities. Accordingly, the present multicentric study aimed to evaluate the prevalence of physical comorbidities and prescription patterns in the elderly with depression. This was a multicentric study, conducted in 8 centers across the country, under the aegis of the Indian Association for Geriatric Mental Health, detailed methodology of which is already published. The study was approved by all the local Institutional Ethics Committees of the institutes in which this study was conducted. All the participants were explained about the study and were recruited after obtaining written informed consent. The study followed a cross-sectional design in which participants were assessed only once. To be included in the study, patients of either gender, aged ≥60 years, fulfilling the criteria of major depressive disorder as per Diagnostic and Statistical Manual of Mental Disorders-IV Edition criteria (DSM-IV) and confirmed by MINI Plus were recruited and those with mental retardation and those too ill to be assessed were excluded from the study. A self-designed physical morbidity checklist was used to assess for the presence of various physical comorbidities. This included names of the commonly seen chronic physical morbidities from all systems of the body (neurological, endocrinological, cardiovascular, renal, hepatic, gastrointestinal, dermatological, infections, malignancies, gynecological, etc., along with an option to record “any other” physical comorbidities, not listed in the checklist. Physical comorbidity was assessed by taking detailed history, physical examination, and reviewing the treatment records. No specific investigations were done as part of the study. All the patients were also rated on Geriatric Depression Rating Scale (GDS-30), Generalized Anxiety Disorder Questionnaire (GAD-7), and Patient Health Questionnaire (PHQ-15). Analysis was done using the Statistical Package for Social Sciences-version 14 (SPSS for Windows, SPSS Inc., Chicago, IL, USA). Descriptive analysis involved calculation of mean and standard deviation (SD) with a range for continuous variables and frequency and percentages for ordinal or nominal variables. Comparisons were done using the Chi-square test, t-test, and Mann–Whitney test. The study included 488 patients diagnosed with depression. Slightly more than half of the study participants were males (53.7%; n = 262), were on paid employment (53.3%, n = 260), and from urban locality (53.1%, n = 259). The mean age of the study sample was 66.55 (SD 5.83) years, and the mean years of formal education was 7.63 (SD 5.85) years. About one-fourth of the samples (25.4%; n = 124) were currently single (unmarried, widowed, separated, and divorced). More than two-thirds of the participants were living in nonnuclear family setup (69.9%, n = 341). Three-fifths of the sample was diagnosed with first episode depression (60.9%; n = 297) and the rest were diagnosed with recurrent depressive disorder (39.1%; n = 191). More than three-fourth of the samples had at least one comorbid physical illness (78.7%, n = 384) [Table 1]. Comorbid substance abuse disorders were found in about one-third (37.9%) of the participants and a small proportion of the participants had comorbid psychiatric disorders (3.1%). The mean age of onset of depression was 60.2 (SD 10.5) years, and the mean total duration of illness was 65.68 (SD 91.80) months. More than three-fourth of the study samples had at least one physical comorbidities (n = 384; 78.7%). About half of the study samples had hypertension (47.3%) and slightly more than one-fourth had diabetes mellitus (29%). More than one-third (36.7%) of the study samples had 3 or more physical illnesses. The most common physical illness involved the cardiovascular system (51.5%), and this was followed by endocrinological system (39.3%), orthopedic and joint-related diseases (35%), and ophthalmological problems (22.3%). Details of involvement of other systems are given in [Table 1]. When patients with and without physical comorbidity were compared, those with physical comorbidity had higher severity of depression, anxiety, and somatic symptom [Table 2]. When compared with those without any physical illness, significant differences were noted in relation to gender (males > females, χ2 = 5.799; P = 0.016*), marital status (single > married, χ2 = 17.802; P < 0.001***), and family type (non-nuclear > nuclear; χ2 = 5.024, P = 0.025*). No significant difference was noted with regard to locality (rural/urban), type of depression (single/multiple episodes) or presence/absence of comorbid psychiatric illness/substance abuse. In addition, those with comorbid physical illness were more older (t-test = 3.216; P = 0.001***), more educated (t-test = 7.173, P < 0.001***) and were depressed for a longer duration in months (t-test = 2.446, P = 0.015*). Majority (91.8%) of the participants were prescribed antidepressants while they were assessed for the study. Among the various antidepressants, sertraline was the most preferred antidepressant followed by escitalopram and mirtazapine. All the patients were on single antidepressant. With regard to antipsychotics, only 12.7% of the sample was prescribed antipsychotics of which quetiapine and olanzapine were the most commonly used agents. Benzodiazepines were prescribed to more than half of the study samples (56.55%), with clonazepam being the most preferred benzodiazepine followed by lorazepam [Table 3]. As is evident from [Table 4], across three centers (Lucknow, Ahmedabad, and Kolkata-1) sertraline was the most commonly prescribed agent. In two centers (Chandigarh and Mumbai), escitalopram was the most preferred agent and in one center (Srinagar), both sertraline and escitalopram were prescribed to an equal number of patients. In one center (Kolkata-2), mirtazapine was the most commonly used agent. In one center (Jodhpur), although sertraline was the most commonly used antidepressant; however, the most common strategy was not to prescribe antidepressant. Tricyclic antidepressants were prescribed to very few patients across the different centers, except for Mumbai center, where these formed about one-fifth (22.2%) of the prescribed antidepressants. Across different centers, antipsychotics were prescribed to very few patients, with quetiapine being the most preferred antipsychotic in three centers (Chandigarh, Ahmedabad and Kolkatta-2), whereas olanzapine was the most preferred antipsychotic in 2 centers (Kolkatta-1 and Mumbai) and aripiprazole emerged as the most preferred agent in one center (Lucknow). None of the participants in Srinagar center were prescribed any antipsychotics [Table 4]. Clonazepam was the most preferred benzodiazepine across six centers (Chandigarh, Lucknow, Ahmedabad, Kolkata 1 and 2, and Jodhpur) and lorazepam emerged as the most preferred agent in other two centers (Srinagar and Mumbai) [Table 4]. 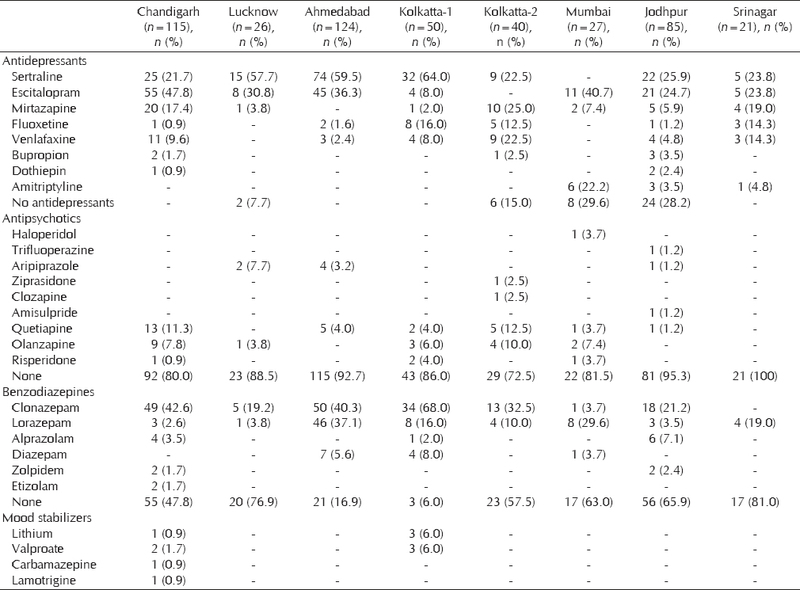 Mood stabilizers were used in very few patients in only two centers, i.e., Chandigarh and Kolkata-1 [Table 4]. As hypertension and diabetes mellitus emerged as the most common comorbidities, prescription patterns were compared between those with hypertension and those without any physical comorbidity. Similarly, prescription patterns were compared between those with diabetes mellitus and those without any physical comorbidity. 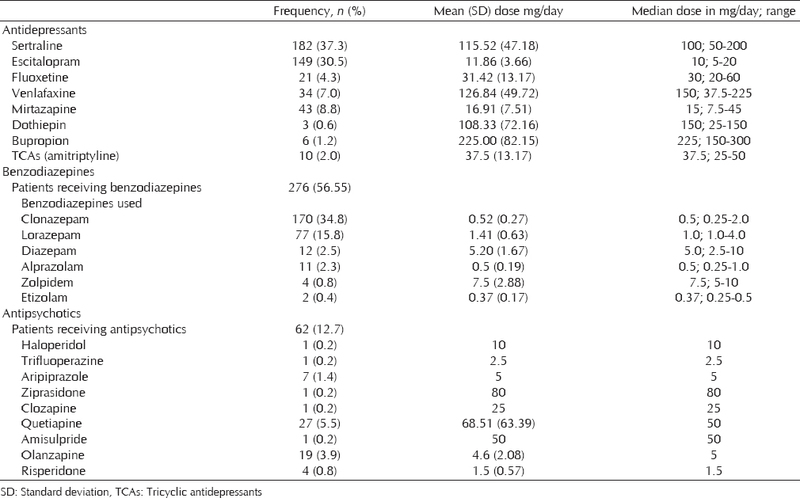 As is evident from [Table 5], sertraline was the most preferred antidepressant and compared to those without any physical comorbidity, patients with hypertension were more commonly prescribed sertraline and escitalopram and less commonly prescribed fluoxetine. Further compared to those with hypertension, significantly higher proportion of patients with no physical comorbidity were not prescribed antidepressants. Again, compared to those without any physical comorbidity, patients with diabetes mellitus were more commonly prescribed sertraline and less commonly prescribed fluoxetine. As in the hypertension group, compared to those with diabetes mellitus, significantly higher proportions of patients with no physical comorbidity were not prescribed antidepressants. The present multicentric study suggests that more than three-fourths of elderly patients with depression have at least one comorbid physical illness (76.4%), which is similar to the prevalence figures reported in the previous studies from India.,, The findings are also comparable to the data (prevalence of 76%–92%) from the Western countries.,,,, Regarding specific physical illnesses, hypertension was the most common diagnosis, seen in about half of the patients (47.3%) and this was followed by diabetes mellitus (28.1%) and osteoarthritis (21.7%). Previous clinic-based studies and a community-based study from India have reported osteoarthritis, hypertension, and cataract as the most common physical comorbidities.,,, However, these clinic-based studies had very small sample size (n = 40) and the community-based study was limited to a specific area (Visakhapatnam, n = 1200). Studies from the West in elderly with depression also report diabetes mellitus and hypertension as the two most common physical comorbidities.,, Findings of the present study are in concurrence with existing Indian (with regard to prevalence of hypertension; 18%–55%) and Western (with regard to the prevalence of both hypertension; 18%–55% and diabetes mellitus; 7.6%–70%) literature irrespective of methodological differences in the assessment of physical comorbidity in these studies. The high level of physical comorbidity in elderly suggests that psychiatrist should focus on physical health of elderly too, and similarly, clinicians managing different physical illness should assess their patients for depression. Further, this fact must be taken into account for prescribing various psychotropics regarding evaluating drug interactions and synergistic side effects of medications used for different disorders. With regard to impact of presence of physical comorbidity on the severity of depression, anxiety and somatic symptoms in elderly depressed participants, it was quite evident that those with comorbid physical illness had greater severity of depression (as assessed by GDS-30), of somatization (as assessed by PHQ-15) and anxiety (as assessed by GAD-7). Only one study from India had previously evaluated the impact of physical comorbidity on the symptom profile of geriatric depression, and this study reported no influence of presence of any physical comorbidity on the symptom profile and severity of depression in the elderly. However, the present study findings are in contrast to the findings of the previous study. The possible reason for this difference could be due to the higher proportion of the patients in the previous study to be having severe depression. However, it is important to understand that a cause and effect relationship cannot be determined from the present study, as this was cross-sectional in nature. Many putative hypotheses can be provided for this association. First, disabling physical morbidities possibly delay the help seeking for depression. Second, it is quite possible that the higher severity noted could be due to overlap of symptoms between the physical illnesses and depression. It would be interesting to evaluate these hypotheses in future by carrying out longitudinal studies. In the present study, there was no polypharmacy which is also in concurrence with the previous studies and guidelines advocating use of single antidepressant/fewer drugs in elderly depression.,, Similarly, with regard to antipsychotics, those with less potential to cause extrapyramidal side effects (second-generation antipsychotics, more preferably quetiapine/olanzapine) were most commonly used medications across the 8 centers and typical antipsychotics were less preferred. There has been a recent upsurge in the use of quetiapine in low doses in elderly participants with depression as well as psychosis because of its sedative, relaxing/calming and anti-anxiety effects.,,,, The present study finding of higher prescription of quetiapine in elderly participants could be influenced by this data. The previous study from India reported olanzapine to be the most commonly used antipsychotic in the elderly participants. However, the study included elderly participants with any psychiatric diagnosis, and hence, the present study could not be compared with the same, though olanzapine was the 2nd most preferred drug in the present study. In the present study, sedative-hypnotic medications were prescribed in more than half of the elderly participants with depression with clonazepam being the most preferred followed by lorazepam. In the previous Indian study on prescription patterns in the elderly participants with any psychiatric diagnosis, benzodiazepines were mostly prescribed to elderly participants with psychotic disorders (43%) with clonazepam being the most preferred, similar to the present study findings. Studies from West also report the use of benzodiazepines in about one-third of the elderly with depression, with clonazepam and lorazepam being the commonly used agents.,,, However, the general consensus is that there should be a limitation to the use of benzodiazepines in the elderly because their several potential side effects such as falls, cognitive decline, osteoporosis, etc., among elderly.,, The high prevalence of use of benzodiazepine could be possibly be due to presence of high level of anxiety in the study sample. The present study has certain limitations. For the present study, participants were recruited from psychiatry outpatient clinics attached to general hospital settings, and hence, the findings may not be generalizable to community-dwelling population or those attending other treatment setting. The physical comorbidities were determined on the basis of history, review of treatment records, and physical examination. No specific investigations were done as part of this study. It is quite possible that lack of detailed investigations could have possibly led to underestimation of the prevalence of physical comorbidities. To conclude, the present study shows that more than three-fourth of the elderly patients with depression have at least one physical illness with hypertension being the most common physical comorbidity followed by diabetes mellitus and osteoarthritis. The presence of a physical illness is associated with more severe depression, anxiety, and somatization. Regarding prescription patterns, sertraline was the most preferred antidepressant in elderly with depression, both among those with and without physical comorbidity. Quetiapine was the most commonly used antipsychotic and clonazepam being the most commonly prescribed benzodiazepine in the elderly participants with depression. Blazer DG. Depression in late life: Review and commentary. J Gerontol A Biol Sci Med Sci 2003;58:249-65. Grover S, Malhotra N. Depression in elderly: A review of Indian research. J Geriatr Ment Health 2015;2:4-15. Gierz M, Jeste DV. Physical comorbidity in elderly veterans affairs patients with schizophrenia and depression. Am J Geriatr Psychiatry 1993;1:165-70. Grover S, Dalla E, Mehra A, Chakrabarti S, Avasthi A. Physical comorbidity and its impact on symptom profile of depression among elderly patients attending psychiatry services of a tertiary care hospital. Indian J Psychol Med 2017;39:450-6. Goh AM, Westphal A, Daws T, Gascoigne-Cohen S, Hamilton B, Lautenschlager NT, et al. A retrospective study of medical comorbidities in psychogeriatric patients. Psychogeriatrics 2016;16:12-9. Loi S, Chiu E. Medical comorbidity in psychogeriatric patients. Curr Opin Psychiatry 2011;24:355-8. Katon WJ. Clinical and health services relationships between major depression, depressive symptoms, and general medical illness. Biol Psychiatry 2003;54:216-26. Mitchell PB, Harvey SB. Depression and the older medical patient – When and how to intervene. Maturitas 2014;79:153-9. Kukull WA, Koepsell TD, Inui TS, Borson S, Okimoto J, Raskind MA, et al. Depression and physical illness among elderly general medical clinic patients. J Affect Disord 1986;10:153-62. Gleason OC, Pierce AM, Walker AE, Warnock JK. The two-way relationship between medical illness and late-life depression. Psychiatr Clin North Am 2013;36:533-44. Krishnan KR, Delong M, Kraemer H, Carney R, Spiegel D, Gordon C, et al. Comorbidity of depression with other medical diseases in the elderly. Biol Psychiatry 2002;52:559-88. Lyness JM, Niculescu A, Tu X, Reynolds CF 3rd, Caine ED. The relationship of medical comorbidity and depression in older, primary care patients. Psychosomatics 2006;47:435-9. Qiu WQ, Dean M, Liu T, George L, Gann M, Cohen J, et al. Physical and mental health of homebound older adults: An overlooked population. J Am Geriatr Soc 2010;58:2423-8. VanItallie TB. Subsyndromal depression in the elderly: Underdiagnosed and undertreated. Metabolism 2005;54:39-44. Alexopoulos GS. Depression in the elderly. Lancet 2005;365:1961-70. Yohannes AM, Alexopoulos GS. Depression and anxiety in patients with COPD. Eur Respir Rev 2014;23:345-9. Grabowska-Grzyb A, Jedrzejczak J, Nagańska E, Fiszer U. Risk factors for depression in patients with epilepsy. Epilepsy Behav 2006;8:411-7. Carney RM, Blumenthal JA, Catellier D, Freedland KE, Berkman LF, Watkins LL, et al. Depression as a risk factor for mortality after acute myocardial infarction. Am J Cardiol 2003;92:1277-81. Tandberg E, Larsen JP, Aarsland D, Laake K, Cummings JL. Risk factors for depression in Parkinson disease. Arch Neurol 1997;54:625-30. Park M, Reynolds CF 3rd. Depression among older adults with diabetes mellitus. Clin Geriatr Med 2015;31:117-37, ix. Arun MP, Bharath S, Pal PK, Singh G. Relationship of depression, disability, and quality of life in Parkinson's disease: A hospital-based case-control study. Neurol India 2011;59:185-9. Mendenhall E, Narayanan G, Prabhakaran D. Depression and diabetes in India: Perspectives and recommendations. Diabet Med 2012;29:e308-11. Pickett YR, Bazelais KN, Bruce ML. Late-life depression in older African Americans: A comprehensive review of epidemiological and clinical data. Int J Geriatr Psychiatry 2013;28:903-13. Steffens DC, Fisher GG, Langa KM, Potter GG, Plassman BL. Prevalence of depression among older Americans: The aging, demographics and memory study. Int Psychogeriatr 2009;21:879-88. Sagar RS, Mohan D, Kumar V, Khandelwal SK, Nair PG. Physical illnesses among elderly psychiatric out-patients with depression. Indian J Psychiatry 1992;34:41-5. Satapthy R, Kar N, Das I, Kar GC, Pati T. A study of major physical disorders among the elderly depressives. Indian J Psychiatry 1997;39:278-81. Sundru M, Goru K. Epidemiological study of depression among population above 60 years in Visakhapatnam, India. Int J Med Sci Public Health 2013;2:695-702. Singh A, Singh T, Gupta S, Yadav J. Prevalence of depression with medical comorbidities among the elderly. Indian J Psychosoc Sci 2013;3:42-7. Newman SC, Schopflocher D. Trends in antidepressant prescriptions among the elderly in Alberta during 1997 to 2004. Can J Psychiatry 2008;53:704-7. Raymond CB, Morgan SG, Caetano PA. Antidepressant utilization in British Columbia from 1996 to 2004: Increasing prevalence but not incidence. Psychiatr Serv 2007;58:79-84. Mamdani MM, Parikh SV, Austin PC, Upshur RE. Use of antidepressants among elderly subjects: Trends and contributing factors. Am J Psychiatry 2000;157:360-7. Grover S, Avasthi A, Sinha V, Lakdawala B, Bathla M, Sethi S, et al. Indian psychiatric society multicentric study: Correlates of prescription patterns of psychotropics in India. Indian J Psychiatry 2016;58:417-24. Grover S, Kumar V, Avasthi A, Kulhara P. An audit of first prescription of new patients attending a psychiatry walk-in-clinic in North India. Indian J Pharmacol 2012;44:319-25. Grover S, Avasthi A, Sinha V, Lakdawala B, Bathla M, Sethi S, et al. Indian psychiatric society multicentric study: Prescription patterns of psychotropics in India. Indian J Psychiatry 2014;56:253-64. Sarkar P, Chakraborty K, Misra A, Shukla R, Swain SP. Pattern of psychotropic prescription in a tertiary care center: A critical analysis. Indian J Pharmacol 2013;45:270-3. Tripathi A, Avasthi A, Desousa A, Bhagabati D, Shah N, Kallivayalil RA, et al. Prescription pattern of antidepressants in five tertiary care psychiatric centres of India. Indian J Med Res 2016;143:507-13. Prasad K, Gupta H, Bharath S, Prakash O, Sivakumar PT, Kumar CN, et al. Clinical practice with antidementia and antipsychotic drugs: Audit from a geriatric clinic in India. Indian J Psychiatry 2009;51:272-5. Grover S, Avasthi A, Tripathi A, Tanra AJ, Chee KY, He YL, et al. Antidepressant prescription pattern in the presence of medical co-morbidity: REAP-AD 2013 study. East Asian Arch Psychiatry 2015;25:99-107. Grover S, Avasthi A, Sahoo S, Lakdawala B, Nebhinani N, Dan A, et al. Indian Association for Geriatric Mental Health's multicentric study on depression in elderly: Symptom profile and influence of gender, age of onset, age at presentation, and number of episodes on symptom profile. J Geriatr Ment Health 2018;5:35-48. Yesavage JA, Brink TL, Rose TL, Lum O, Huang V, Adey M, et al. Development and validation of a geriatric depression screening scale: A preliminary report. J Psychiatr Res 1982;17:37-49. Proctor EK, Morrow-Howell NL, Doré P, Wentz J, Rubin EH, Thompson S, et al. Comorbid medical conditions among depressed elderly patients discharged home after acute psychiatric care. Am J Geriatr Psychiatry 2003;11:329-38. Taylor WD, McQuoid DR, Krishnan KR. Medical comorbidity in late-life depression. Int J Geriatr Psychiatry 2004;19:935-43. Lacruz ME, Emeny RT, Haefner S, Zimmermann AK, Linkohr B, Holle R, et al. Relation between depressed mood, somatic comorbidities and health service utilisation in older adults: Results from the KORA-age study. Age Ageing 2012;41:183-90. Amr M, Amin TT, Al-Saeed U. Comorbid physical and psychiatric disorders among elderly patients : A study at an outpatient clinic in Saudi Arabia. Arab J Psychiatry 2013;24:133-41. O'Connor CM, Jiang W, Kuchibhatla M, Silva SG, Cuffe MS, Callwood DD, et al. Safety and efficacy of sertraline for depression in patients with heart failure: Results of the SADHART-CHF (Sertraline against depression and heart disease in chronic heart failure) trial. J Am Coll Cardiol 2010;56:692-9. Avasthi A, Grover S. Clinical practice guidelines for management of depression in elderly. Indian J Psychiatry 2018;60:S341-62. National Institute for Health and Clinical Excellence. Guidelines for Treatment of Depression in Adults with a Chronic Physical Health Problem: Treatment and Management, (CG 91). Manchester, UK: National Institute for Health and Clinical Excellence; 2009. American Psychiatric Association. Practice Guideline for the Treatment of Patients with Major Depressive Disorder. 3rd ed. Arlington, VA: American Psychiatric Association; 2010. Liu CP, Leung DS, Chi I. Social functioning, polypharmacy and depression in older Chinese primary care patients. Aging Ment Health 2011;15:732-41. Yuruyen M, Yavuzer H, Demirdag F, Kara Z, Cengiz M, Yavuzer S, et al. Is depression a predictive factor for polypharmacy in elderly? Bull Clin Pharmacol 2016;26:374-81. Jaskiw GE, Thyrum PT, Fuller MA, Arvanitis LA, Yeh C. Pharmacokinetics of quetiapine in elderly patients with selected psychotic disorders. Clin Pharmacokinet 2004;43:1025-35. Madhusoodanan S, Brenner R, Alcantra A. Clinical experience with quetiapine in elderly patients with psychotic disorders. J Geriatr Psychiatry Neurol 2000;13:28-32. Hattori H, Matsumoto M, Morimoto S, Tsuchiya H, Miyauchi E, Takasaki M, et al. Effects of low-dose quetiapine on psychotic symptoms in elderly patients with physical illnesses: Report of eight cases. Psychogeriatrics 2003;3:39-44. Montgomery SA, Locklear JC, Svedsäter H, Eriksson H. Efficacy of once-daily extended release quetiapine fumarate in patients with different levels of severity of generalized anxiety disorder. Int Clin Psychopharmacol 2014;29:252-62. Montgomery SA, Altamura AC, Katila H, Datto C, Szamosi J, Eriksson H, et al. Efficacy of extended release quetiapine fumarate monotherapy in elderly patients with major depressive disorder: Secondary analyses in subgroups of patients according to baseline anxiety, sleep disturbance, and pain levels. Int Clin Psychopharmacol 2014;29:93-105. Valenstein M, Taylor KK, Austin K, Kales HC, McCarthy JF, Blow FC, et al. Benzodiazepine use among depressed patients treated in mental health settings. Am J Psychiatry 2004;161:654-61. Cheng JS, Huang WF, Lin KM, Shih YT. Characteristics associated with benzodiazepine usage in elderly outpatients in Taiwan. Int J Geriatr Psychiatry 2008;23:618-24. Fourrier A, Letenneur L, Dartigues JF, Moore N, Bégaud B. Benzodiazepine use in an elderly community-dwelling population. Characteristics of users and factors associated with subsequent use. Eur J Clin Pharmacol 2001;57:419-25. Bartels SJ, Horn S, Sharkey P, Levine K. Treatment of depression in older primary care patients in health maintenance organizations. Int J Psychiatry Med 1997;27:215-31. Hanlon JT, Horner RD, Schmader KE, Fillenbaum GG, Lewis IK, Wall WE Jr., et al. Benzodiazepine use and cognitive function among community-dwelling elderly. Clin Pharmacol Ther 1998;64:684-92. Picton JD, Marino AB, Nealy KL. Benzodiazepine use and cognitive decline in the elderly. Am J Health Syst Pharm 2018;75:e6-12.